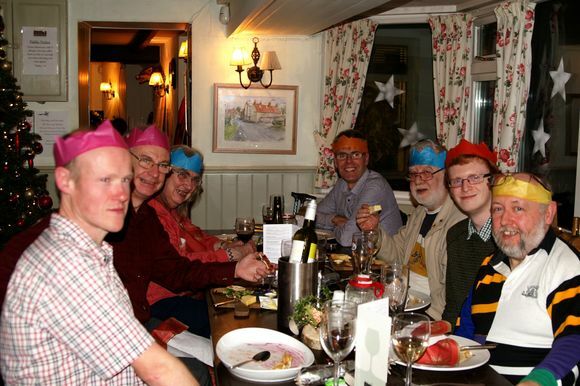 Our Christmas meal at the Hare and Hounds once again proved a great success. Even though only seven members made it to the banqueting table on the date chosen (and no we didn’t lose any on the way up) did not detract from the evening. The food was really excellent, as good as we could remember for such an occasion, the toffee cheesecake was to die for. The only slight let down was the standard of cracker jokes and toys – they do seem to get worse each year wherever you go. I must mention the weather. We have experienced all types over the years, snow and ice, wind, fog, torrential rain. This year felt more like club Tropicana – 13 degrees at 22:30pm, just like the spicy carrot soup...phew what a scorcher. Here’s to next year’s bash... can’t wait!